UPDATE (12:30PM) -- Troopers now say there were ten people injured in a vicious crash on State Road 82 in Lehigh Acres Monday morning. According to Florida Highway Patrol, 17-year-old Harrison Gargano of Lehigh was driving a truck with one passenger towing a boat on Columbus Boulevard. Gargano pulled out into the path of a van with 8 occupants on State Road 82, and the van struck the left side of the truck. Both men in the truck suffered serious injuries and were taken to Lee Memorial Hospital. All eight men in the van were injured, four of those critically. They were all taken to Lee Memorial as well. 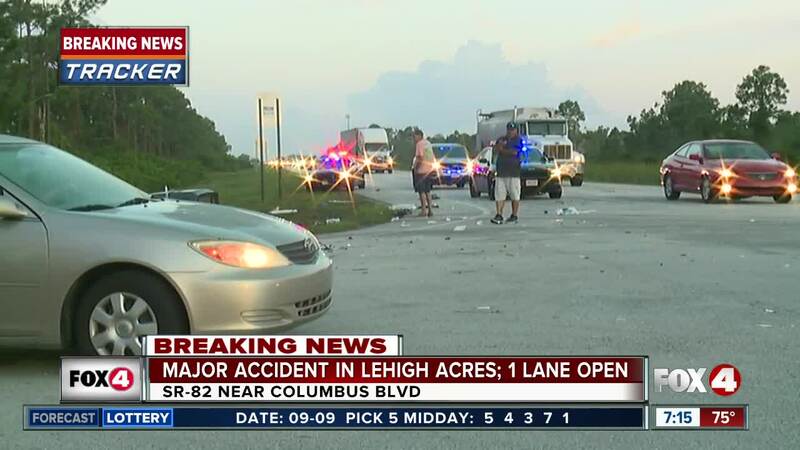 LEHIGH ACRES, Fla. -- Nine people were injured in a serious crash on State Road 82 in Lehigh Acres Monday morning. The crash is at the intersection with Columbus Boulevard and involved a van and a pickup truck towing a boat. Lt. Greg Bueno with Florida Highway Patrol says the truck was southbound on Columbus Boulevard at a stop sign and pulled out onto State Road 82 into the path of a westbound van. A total of nine people were in the vehicles. All were taken to the hospital, with four listed in serious condition. Florida Highway Patrol, Lee County Sheriff's Office, and Lehigh Acre Fire are all on the scene. There are lengthy backups in both directions of State Road 82. We'll update as we get more confirmation on details.